Aluminium Formwork RCC by Korean Technology (S-Form). 1 year warranty after possession . Project to be managed by Professional Maintenance Agency. Provision of 2 parkings per apartment. Home-lovers looking for quality residences in Noida should have a look at Sethi Venice. The residential complex has come up in Sector 150 in Noida. The project has been attracting investors from various parts of the country, due to its strategic location and elegantly designed apartments. If you are looking for a sophisticated living space, you can buy property in the estate now. Noida is one of the fastest developing residential hubs in the country. It is a commercially important location, and its proximity to Delhi has further increased the demand for property in the region. The area has witnessed tremendous growth in infrastructure in the last decade. Upgraded roadways and well-developed transportation system in the residential complex ensures seamless connectivity to all the areas. You can go for the 3.5 and 4 BHK apartments in the residential complex. The prices of these luxurious apartments start from INR 69 lakhs. The interiors of the apartments are sophisticated, and these are loaded with lifestyle and fitness amenities. The quick access to Noida Expressway enhances the navigation facilities of the residents to different parts of the city. If you are willing to embrace a home with green living facilities, you will find your ideal abode in the residential complex. The estate has got beautifully landscaped gardens. A large area of the estate has been dedicated for public use. An intelligent floor planning ensures the optimum utilization of space. The wide balconies and large windows in the apartments ensure optimum ventilation. Get an apartment in Sethi Venice Noida and live up to your housing dreams. Well, Sector 150 is a part of the Sports City and you can get easy connectivity to Delhi NCR region from the residential complex. The dense network roadways ensure seamless connectivity between the important areas within the city. The commercial importance of the area is one of the key reasons behind the increasing demand for quality homes. A number of blue-chip companies have come up in the area, enhancing the employment potential of Noida. Entertainment facilities in the region are immense. You can reach the shopping malls and multiplexes in the area in quick time from the estate. Besides, the educational and healthcare infrastructure in Noida is well-developed. A number of schools and hospitals are located close to the residential complex. The residents can reach these areas easily through the well-developed transportation system. The residential complex comes with a wide range of amenities. When you get an apartment in Sethi Venice Sector 150, you can enjoy the swimming pool, gym, clubhouse and a variety of indoor and outdoor games. Kids have their dedicated play areas to enjoy their time. The estate has also got a health club with steam and sauna. You can enjoy your time in the aerobics room, or engage yourself in the library, reading books. 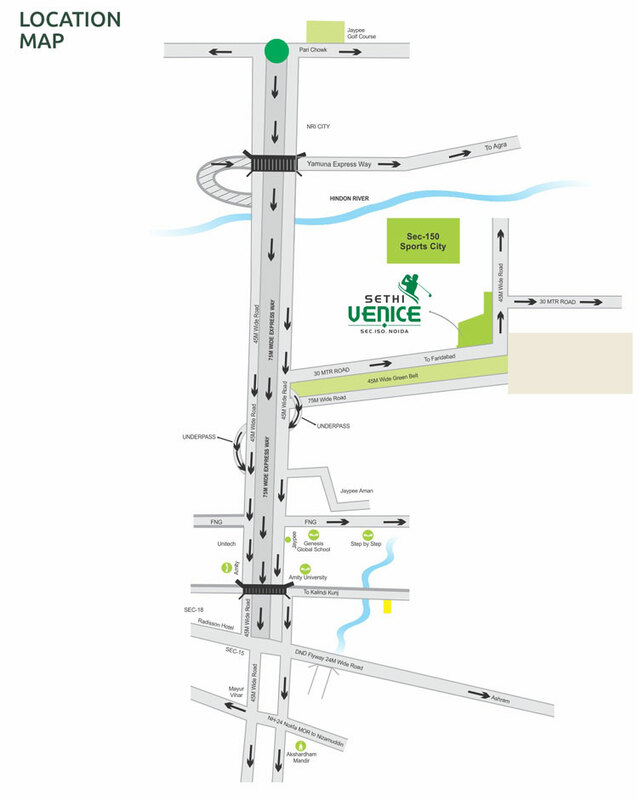 Located at Sec-150, Expressway, Noida. Very near to proposed ISBT by noida authority. Bang opposite 42 Acres of Green park, named Saheed Bhagat Singh Park.